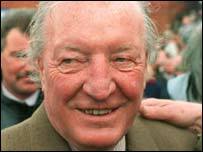 Former Irish Prime Minister Charles Haughey has died at his Dublin home at the age of 80 after a long illness. Mr Haughey had been suffering from prostate cancer and associated complications for a number of years. Premier for three separate terms between 1979 and 1992, he was widely considered to be the most controversial Irish politician of his generation. Taoiseach Bertie Ahern said he had no doubt history's "ultimate judgement on Mr Haughey will be a positive one". Irish President Mary McAleese said Mr Haughey had played a "highly significant, central and leading role in national politics". Mr Haughey's condition worsened in recent days and family members were keeping a vigil at his bedside at his north Dublin home at Kinsealy. A son-in-law of former Taoiseach Sean Lemass, he first hit the headlines in 1970 when he was dismissed from the cabinet over allegations that he attempted to import arms for the Provisional IRA. He was later cleared of the charge in court. The man who once described Northern Ireland as "a failed political entity" never hid his dislike of the Irish border. In a television documentary in the 1980s, he said: "It's guarded by units of the British army and I can never come up to this border without experiencing deep feelings of anger and resentment." He was Taoiseach three times - the first was in 1979. 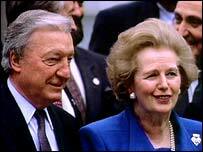 Although he was never trusted by Northern Ireland's unionists, he enjoyed initial good relations with the then British Prime Minister Margaret Thatcher. But her handling of the IRA hunger strikes of 1981, in which 10 prisoners in the Maze jail starved themselves to death, soon saw a cooling off in the relationship. Out of office, he opposed the signing of the Anglo-Irish Agreement, but as Taoiseach two years later, he worked within the terms of the accord. Loved and disliked in almost equal measure, Charles Haughey was never given an overall majority by the Irish electorate. He survived so many leadership challenges that he became known as the Great Houdini. But in 1992, a 10-year-old phone bugging scandal led to his resignation as taoiseach. Out of office, his reputation became greatly tarnished. His long-time mistress Terry Keane revealed details of their affair. Speaking on Irish television, she said: "Charlie was a very important part of my life. He shaped me, he changed me in many ways and we've had a wonderful time together." Charles Haughey enjoyed a lavish lifestyle. He owned a yacht, his own island, race horses and a mansion. Many believed he was the ideal man to deal with the Irish Republic's chronic debt problem. In 1980, he said: "The figures that are just now becoming available to us show one thing very clearly - as a community we are living away beyond our means." But it wasn't just the state that was living beyond its means in the 1980s. Its leader's lavish lifestyle was paid for by the patronage of business leaders such as chain store owner Ben Dunne, who gave Mr Haughey millions of pounds. He gave evidence to two tribunals that inquired into his finances. One heard that money intended for a liver transplant for the late Brian Lenihan, a former government minister, ended up in Charles Haughey's bank account. At one stage, he faced possible imprisonment for obstructing one of those investigations. Two years ago, he agreed to pay 5m euro to the country's Revenue Commission to settle outstanding tax liabilities. In April 2000, he paid out 1.28m euro as an interim settlement on tax owed on gift payments he received in the 1980s from Ben Dunne. He had been ill for several years, suffering from both prostate cancer and a weak heart.